So I have a confession. This past week was a train wreck in terms of my health & fitness. I missed more workouts than I got in, I made poor food choices on several occasions, I did not keep myself accountable. In the past this is where I started down a slippery slope. I would let a few bad days turn into an excuse to slack for the next few weeks, which would in turn throw me completely off track & eventually throw in the towel all together. These days the story is different. 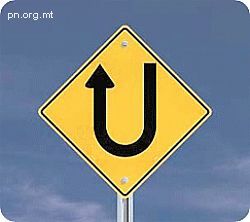 I am making a U-TURN! I am putting the mis-steps of last week behind me & turning back to the ways that I KNOW lead to SUCCESS. I made my meal plan for the week. I did my grocery shopping so my kitchen is stocked with clean, healthy foods. Tomorrow I start a new workout program, Focus T25. I looked at my workout schedule so I know which workout I'm doing, when I'm doing it, and where I'll be working out. I will keep myself accountable by posting my workouts & meals on my Fit Momma of Four Facebook page. Follow my journey this week & beyond at facebook.com/FitMommaOfFour and here a jhrbekfitmommaoffour.blogspot.com.